Quit dreaming about Rome and start planning! Save money, beat the crowds and learn about Rome’s coolest “secret spots” with 53 Rome Travel Tips. In 53 Rome Travel Tips, I dispense my very best advice for traveling Rome. Gleaned from over 15 years of travels to the great Eternal City, my secrets and insight will help you plan and execute the perfect Rome getaway. You’ll learn how to skip crowds, find the city’s best values and experience Rome more like a savvy local than a bewildered tourist. Whether it’s your first time in Rome or you’re back for more, this book will teach you something new. 53 Rome Travel Tips offers Rome travelers invaluable advice on how to make the most of a Rome vacation. 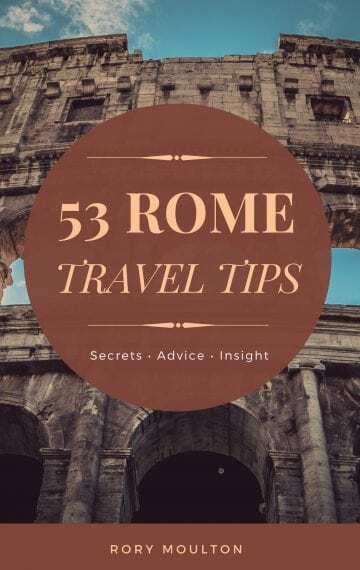 53 Rome Travel Tips includes little-known nooks and crannies in Rome, quintessential dining experiences, travel hacks for skipping lines and saving time and money and everything you need to know for an awesome Rome experience — condensed into the most important travel tips for Rome. Tips on how to avoid long lines in Rome. Insight on how to make the most of Rome’s museums and attractions. Advice on how to beat Rome’s crowds and have the coolest Rome experiences. Plus, tons of Rome sightseeing and eating tips!